MUMM-RA transforms himself into a troll GRYGORY GRYGION and tricks LION-O into attacking TYGRA and breaking the Sword of Omens. JAGA tells them that combat between two THUNDERCATS brings on the Curse of Balthaz, rendering the broken Sword powerless. RO-BER-BILL guides them to a mercenary, the INFLAMER, who [re-]forges the Sword with the Star Fire in the heart of the Volcano. 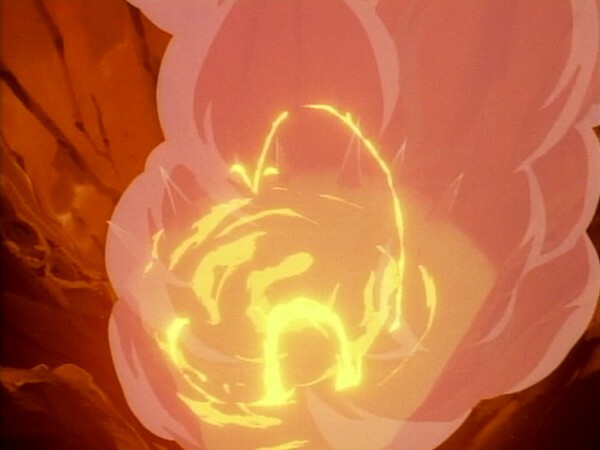 The INFLAMER turns against the THUNDERCATS, however, and the ThunderTank has to blast into the Volcano to save LION-O and the renewed Sword. In anger, the INFLAMER blows up the Volcano. LION-O uses the Sword’s force field to shield the Tank from the fire rocks as it rides to safety. 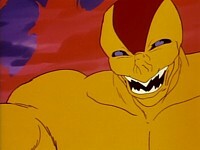 Lion-O, tricked by Mumm-Ra, acts instinctively and impulsively in attacking Tygra, who he thinks is a robber. Realizing the tragic consequences, he admits to Jaga he should have taken time for reflection before he acted. In contrast to his impulsive action are his calculated persistence and his unwillingness to give up in the task of locating the dwarf star. These actions, inspired by planning and motivation, lead to a successful reforging and reclamation of the Sword of Owens. MUSSEN, P. H., Conger, J. J., Kagan, J., & Huston, A. C. (1984). Child Development and Personality (6th Ed.) (pp. 250-253). New York: Harper & Row. Such is the loyalty and bond between the ThunderCats that one of the most shocking things conceivable is the thought of them fighting amongst each other. Although through various means it does happen very occasionally within the series (most notably in “Catfight”), rarely does it have more startling and dramatic consequences than it does in this episode. 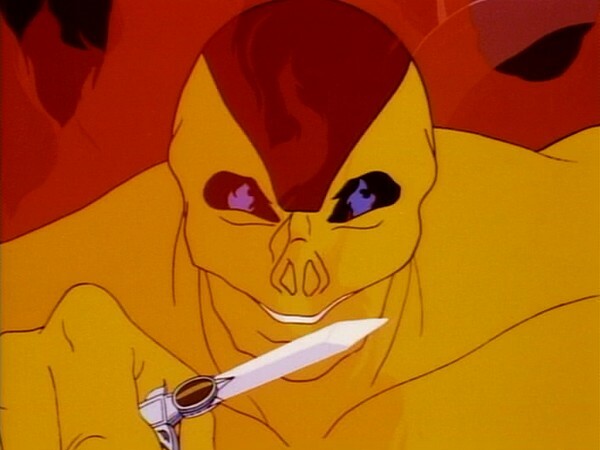 Although ostensibly an episode about the (temporary) destruction of the Sword of Omens, in reality this episode is more about developing and building upon the character of Lion-O. In the series’ earliest episodes, we see Lion-O growing very slowly into his role of Lord of the ThunderCats, beginning as a boy stuck in a man’s body, eager to prove himself and full of lion-like pride occasionally bordering on arrogance. 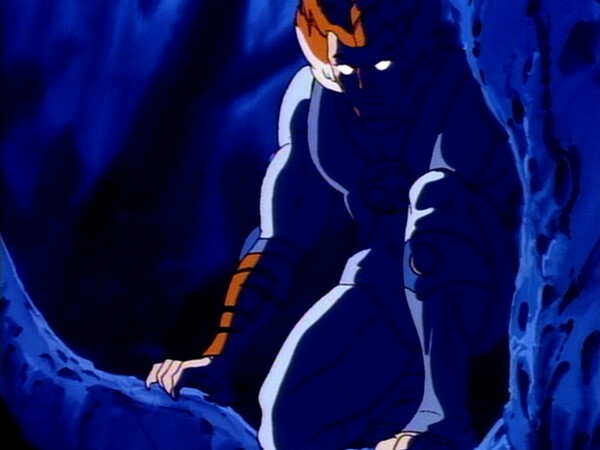 Over the course of the series so far, we’ve seen Lion-O mature into more of a leader and become gradually more at ease with the other, elder ThunderCats, who come to view him more as an equal rather than as the pre-adolescent whose development they were entrusted with. 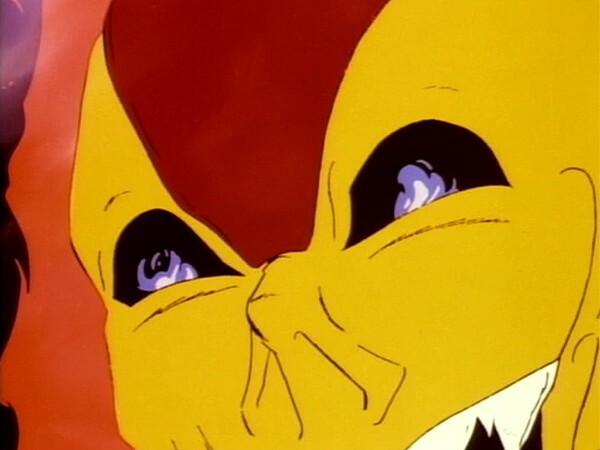 However, this episode in many ways provides a good test for where Lion-O’s maturity is at this point in the series; for, imbued with a sense of morality and a desire to aid someone he perceives as a likeable, helpless victim, Lion-O lashes out without thinking, and in so doing commits arguably the greatest crime against the Code of Thundera—he attacks another ThunderCat! That using the Eye of Thundera to attack a fellow ThunderCat should bring down a curse such as the one that robs the Sword of Omens of its power is a very clever plot device, because it serves as a catalyst to focus the audience’s attention on the very core elements of the ThunderCat characters: their sense of family, of responsibility, and of Lion-O’s noble but flawed character, the development of which is the central theme of many of these early episodes. 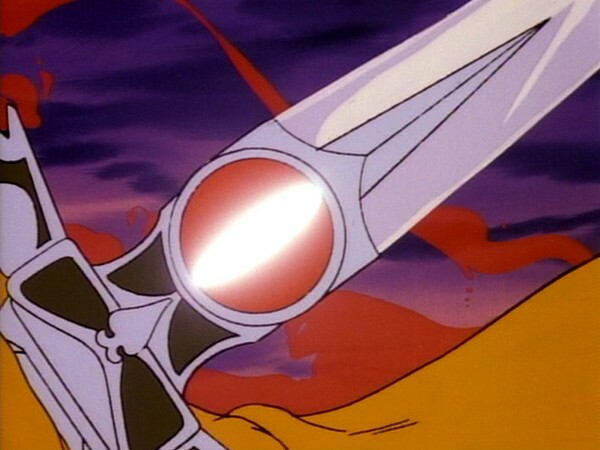 This episode also serves as a great showcase for the Sword of Omens itself, for, although not displaying quite the sentience it would show in other installments, it nonetheless shows what a central part of the ThunderCats’ lives the Sword and the Eye are. In many ways this could have been showcased even more had the ThunderCats themselves demonstrated some physical reaction to the Sword’s damage, as seen in “Excalibur” when the Eye of Thundera is mortally wounded. 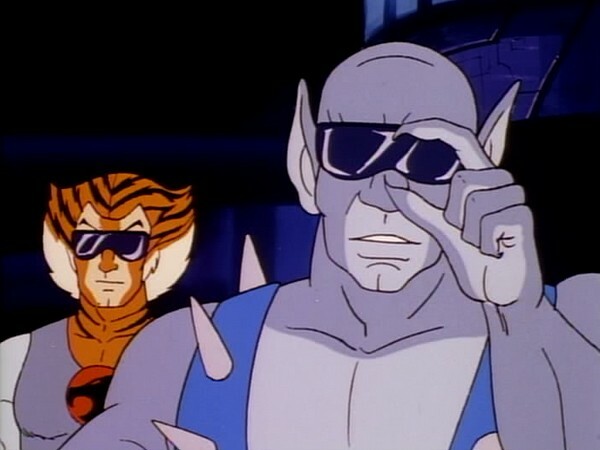 However, it would appear that the ThunderCats themselves are only affected when the Eye itself, being the source of their power, is damaged, not just when the Sword of Omens is damaged. This actually makes sense, implying that the Sword is but a vessel for the Eye’s power. 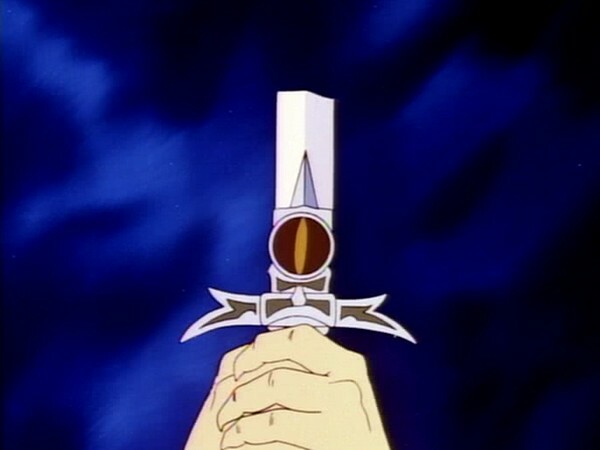 Damage to the Sword prevents the Eye of Thundera from manifesting its powers, but does not automatically transfer harm to the Eye itself, or the ThunderCats in turn. This episode is also an excellent vehicle for Cheetara, and further underlines the brilliant and insightful way that the writers deal with her character. 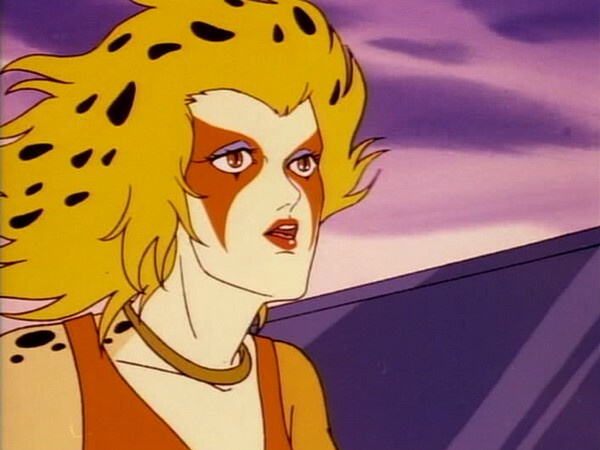 In this episode, despite her continuing persona as a no-nonsense feline warrior woman, Cheetara shows a (stereotypically) feminine weakness for the beauty of gold. Despite being derided by Panthro as “junk”—a stereotypically male assessment, it could be argued—the dazzling metal attracts Cheetara, and her flouting of Pantho’s derision manages to save the day; she saves some, and it restores the Inflamer’s powers. As I’ve stated before, at this end of the ThunderCats series there are very few weak episodes, and this one has long been a personal favorite of mine. Showcasing the maturity (or still lack of same) of the series’ lead character, and crafting a captivating story around that, for me this episode shines like the substance it was named after. In short, “All That Glitters” is pure storytelling gold! Despite the fact that several ThunderCats adventures have taken place since, this episode nonetheless is a sequel to “Lord of the Snows”. 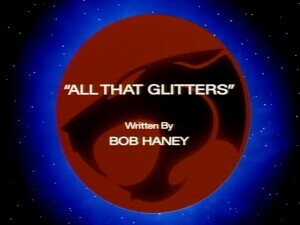 Not coincidentally, it also happens to be the second ThunderCats script penned by Bob Haney, “Lord of the Snows” being the first. 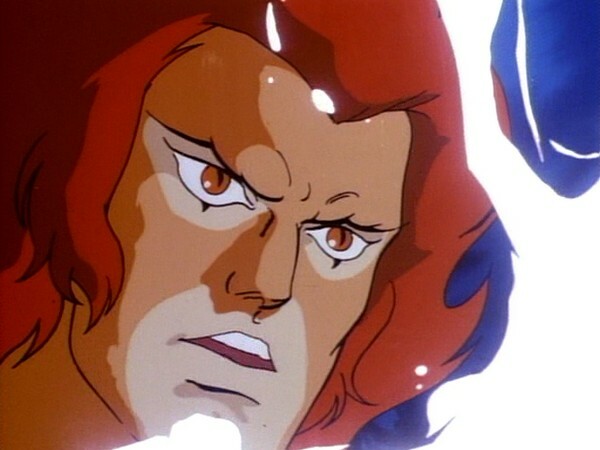 Upon discovering that he has been tricked into battling Lion-O, Tygra exclaims “By the twelve seas of Thundera!”, thus revealing that Thundera must have had twelve seas! This episode marks the first of four occasions (and the only time in the first season) that the Sword of Omens’ blade is broken. 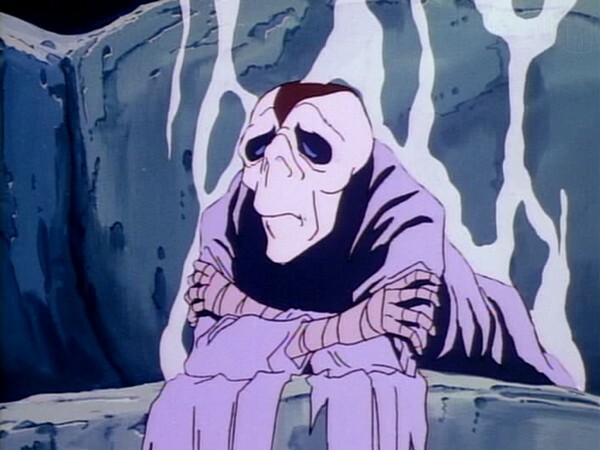 However, in all of the other instances (“Mumm-Ra Lives! Part II”, “Return to Thundera! Part II”, “The Heritage”), the Sword was repaired with comparative ease! This could imply that the star fire needed to reforge it in “All That Glitters” is a requirement only of the Curse of Balthaz. 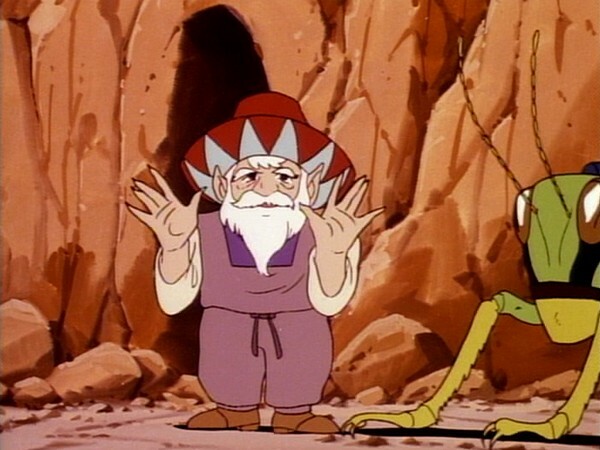 Mumm-Ra’s disguise as Grygory Grygion is as much a surprise to the audience as it is to Lion-O, Snarf, and Tygra! This assuming of a disguise without our knowledge is very effective, and is employed again in “The Mask of Gorgon”. This episode is one of very few (“Psych Out!” is another) in which the plot never circles back to Mumm-Ra after he sets it in motion. This episode was featured fourth in the F.H.E. Home Video release, “The Spaceship Beneath the Sands”, alongside “Dimension Doom”, “Trapped”, and the eponymous episode. As such, Tygra’s exasperated “S-S-Slithe and Mumm-Ra again!” line comes across as even more contextually accurate.